The Summer Time 56 foot houseboat is permanently moored in the Atchafalaya National Heritage Area, one of Louisianas finest bayous. Relax in the quiet scenic beauty, while you enjoy sightseeing, fishing, bird watching, swamp tours, star gazing, hiking, boating, and much more. Dine and dance to live Zydeco/Cajun/country music on the weekends at local venues. Gaze at the night stars from the comfort of your private upper deck hot tub and enjoy the sounds of nature! Summer Time is convenient to New Orleans, Lafayette, and Baton Rouge. She has three bedrooms and two full bathrooms and sleeps up to 10 people. Summertime is equipped with a fully equipped kitchen, cable TV, WIFI, A/C and heat. Towels and linens are provided. 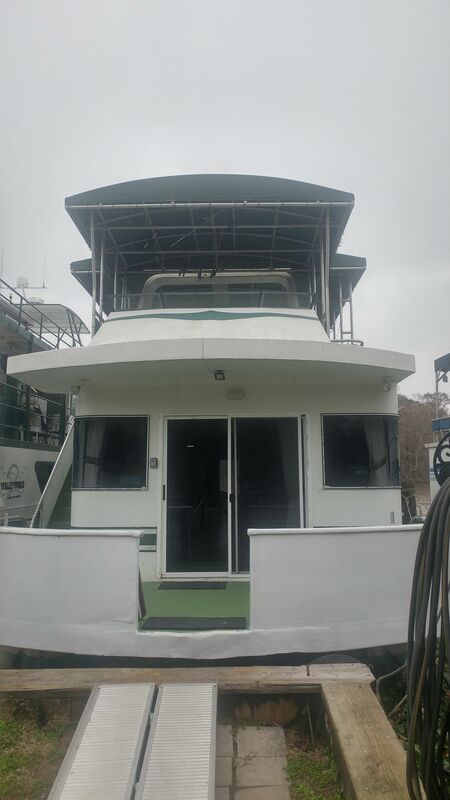 The upper deck overlooks Bayou Long and boasts a Green Egg grill, hot tub/Jacuzzi, dining area and wet bar. Two Kayaks are available free of charge for further bayou exploration. The houseboat is permanently moored and does not go out. Responsible smoking is allowed on upper deck only.